The battle in the air in the first months of the war 1914-15. 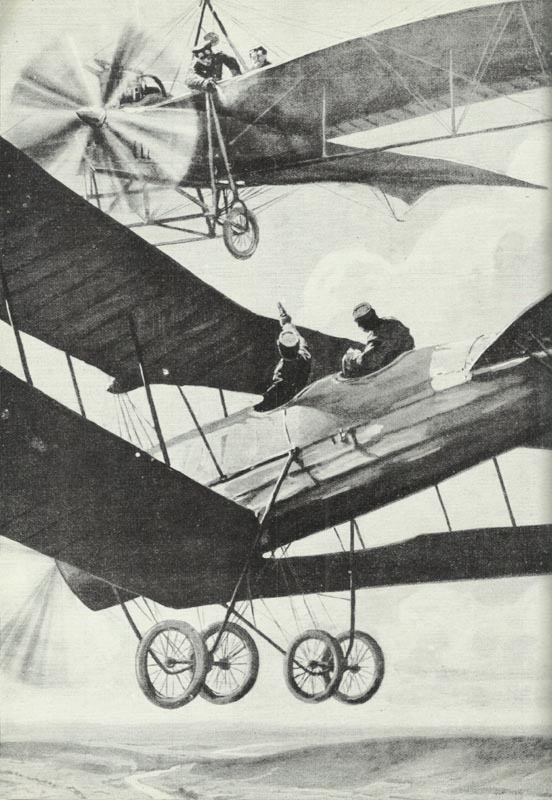 A short time later, the rapid development of aircrafts replaces the pistols and rifles by fire bursts of machine guns. Occupied Belgium: RNAS drops 27 bombs on Zeebrugge U-boat base. France: 12 German BAG aircraft bomb Dunkirk, but RFC 4 Squadron shoot down 1 Albatros B-type with rifle fire. Argonne: Heavy fighting at Fontaine Madame and St Hubert. Syria: Cruiser HMS Doris gives food to Ruad Islanders, landing party cuts telegraph line at Alexandretta on January 25. East Africa: Kitchener forbids offensive operations, coast area evacuation begins on January 29. Britain: Heavy snow in London. Germany: Kölnische Zeitung publishes Russian atrocity story.